Hardly a day goes by without an advertisement or marketing scheme that reinforces how companies are going green. Billions of dollars are spent every year to help make the earth a cleaner, healthier place to live. Help do your part by purchasing devices that are environmentally friendly and easily recyclable. to substitute toxic materials used in their devices with those that are more environmentally friendly. Greenpeace’s goal is to push companies into making environmentally clean products that can be recycled and disposed of safely so they don’t end up in landfills. 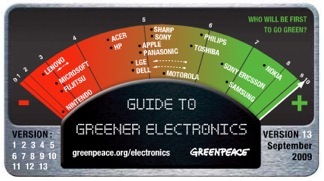 Every few months, Greenpeace releases their “Guide to Greener Electronics”. This spectrum shows how each company ranks on their green scale and how they’ve improved (or failed to) in relation to their previous score. Currently, the greenest electronics manufacturer is Nokia. Nokia’s take-back program and recycling information provided to customers earns the highest spot in Greenpeace’s rankings. Unfortunately, Nintendo currently rests at the bottom for their increasing in greenhouse gas emissions. For full rankings on your favorite companies, check out Greenpeace’s website. If you’re anything like the millions of consumers in the world, you’ve got old electronics stored in the basement or packed in junk drawers. These same people haven’t a clue where to start when it comes to recycling your gadgets. Fortunately, there’s a company founded in 2008 called YouRenew that allows you to exchange your old electronic devices into cash if they’re working or not. YouRenew has a huge database that allows you to search for electronics, answer a few questions about the condition, and get instantly paid via check or Paypal. YouRenew is also partnered with two environmental agencies that allow you to choose where YouRenew should make a donation with every trade-in. If you’ve got any old gadgets collecting dust, be sure to check out YouRenew. The path to a greener future doesn’t rest solely in the hands of manufacturers. It takes pressure from environmental agencies to really push companies into a greener future. As a consumer, you’ve got to be informed and do what you can to help make the world a greener place. Do your gadgets usually end up in the trash? 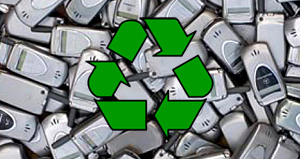 Where have you recycled your gadgets? Let us know you’re doing your share.